Tastes Like Love: See you later 2013, its been a blast! 2013 has been incredible, and has gone incredibly fast. Even though this is the last day of the year, I still have this unsettling feeling about it coming to an end because it still feels as though the year is lingering around the April/May/June part. It most certainly does not feel like the 31st of December. When people told me that having a baby makes the time go by faster I didn't quite understand how that could be, especially when some weeks during my pregnancy seemed to go by at a snails pace. But now I am ending the year with an 8 month old baby and that alone is quite overwhelming. This year was big for Luke & I, we started the year off with a dinner picnic in the park talking about how much things were going to change for us in 2013, but we had no idea just how much they would. We both kept busy working and on the odd day off together we would rush around trying to get things organised. We bought a new car, applied for and paid off our very first bank loan, we moved house at the last minute, and welcomed our beautiful daughter Romy into the world a month early. Romy's early arrival was one of the biggest challenges Luke & I have had so far, firstly because we had barely unpacked our things in our new house, and secondly I did not prepare myself for a caesarean, or the recovery process. I kept my mind occupied with working and making lists of all the things I had to get organised before hand that I never actually read any of the material I was given at my midwife appointments. I started to read a little bit about the birthing process and got really overwhelmed, and that was that, I had read enough. Even though my hospital experience was awful, in hindsight I can't help but think that everything happened exactly the way it was suppose to. And although the start was a bit rocky, this motherhood thing has been one of the best experiences of my life. 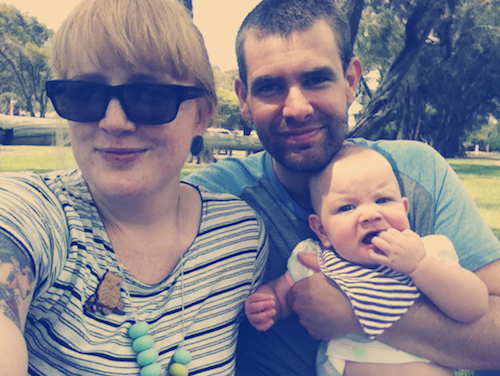 Luke & I didn't plan to have a baby, but the universe gave us Romy at exactly the right time. It is sometimes even hard to believe we never had her! Before Romy, I had next to no experience with children, so much so I changed my first nappy in hospital. I didn't know how to bath or burp a baby, or the importance of being organised because I've never had to organise anyone else except for myself. And I can sometimes get a little too laid back with things. So 2013 has been a big learning curve for me. When the end of the year comes around I start to panic about finishing off books, projects, drawings and crossing the last thing off one of my lists. And this year is no different, only I am just as excited about the new year ticking over as I am panicked. So many wonderful things will be happening in the New Year, for one we will be moving and will no longer be living amongst some of the most unreasonable people I have encountered in all my renting years. Which will take a huge pressure off, as these neighbours create a drama on a weekly basis. Even as I type this my neighbour is watching my house with the creepiest smile I have ever seen. Luke will be changing jobs so he no longer will be working for an employer who has little family values. I will be able to see more of my best friend who has recently had a baby herself, so that will be wonderful seeing our babies play and grow together. And I will be changing some things up on my blog in the New Year. There is so much to look forward to, and I am looking forward to sharing it all here! See you next year! It feels like just yesterday it was Boxing Day and I was thinking how there were still five more days until the new year.. now it's January 2nd and I'm still not fully back into the swing of things after Christmas! P.s. There's a few photos of Romy in your instagram feed (the one where she's just spewed on Luke's shoulder, and in particular this one: http://instagram.com/p/hPbBCKlBpd/) where she looks EXACTLY like me when I was her age. I showed them to my Mum the other day and even she had to agree, haha! I swear time is going faster each year! And I wish the same for you & Ben, I hope you have a fantastically positive 2014! Aww, I'd love to see a baby Felicity photo!